The EOS 6D features a newly developed Canon Full-Frame 20.2 Megapixel CMOS sensor for high resolution, perfectly detailed images delivered with incredible speed and performance. A 35.8mm x 23.9mm sensor captures images of 5472 x 3648 pixels with a pixel size of 6.55 µm square for fantastic detail and a superior signal-to-noise ratio, resulting in great images from the start. With no conversion factor, the EOS 6D's sensor ensures that lenses mounted on the camera will deliver the same angle of view they would on a traditional 35mm camera. 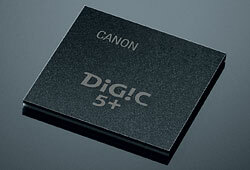 Working in tandem with the EOS 6D's DIGIC 5+ Image Processor, the sensor containing a new photodiode structure delivers ISO sensitivities of 100-25600 (with expanded sensitivities of L: 50, H1: 51200, H2: 102400) and can shoot at up to 4.5 frames per second. Wrapped up in the EOS 6D's compact and lightweight body, photography with a full-frame sensor has never been so easy and so portable. The EOS 6D has an entirely new 11-point AF system for fast, accurate AF no matter the situation. With its new centered cross-type AF point with EV -3 sensitivity for improved performance and focus in low light, and a newly developed and bright 21mm eye point viewfinder with 97% coverage, the EOS 6D offers impressive performance in both composition and AF, even in the dimmest lighting situations. Offering not only One-Shot AF, AI Servo AF, and AI Focus AF, the EOS 6D's AI Servo focus can be customized with tracking, acceleration and deceleration tracking sensitivities, and 1st or 2nd image priority adjustments. For even more customization, adjustment levels for the wide-angle and telephoto ends of particular lenses can be entered and recorded into the camera's memory. The EOS 6D features Canon's multi-layer 63-zone iFCL (intelligent Focus Color Luminance) Metering System that integrates the camera's AF system into its readings. By taking into account the color and luminosity surrounding the chosen AF point(s), this system delivers accurate results, especially in situations where the light changes quickly. 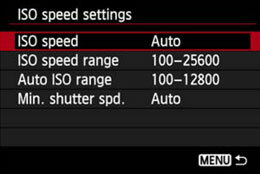 The metering sensor enables evaluative, center weighted, partial and spot metering, plus offers 5-step exposure compensation for perfectly exposed images, every time. The EOS 6D captures HD video with a level of sophistication on par with professional movie cameras, offering phenomenal performance on a DSLR. It offers both All-I (UHS-I memory card is required) and IPB compression, supports H.264/MPEG-4 AVC High Profile, and automatically splits files greater than 4GB (FAT specifications) for extended recording without interruption. It offers the option of timecoding during recording only (Rec Run) or at all times (Free Run), useful for multi-camera shoots. It also features improved sound recording adjustment capabilities, offering 64-step volume control accessible through the Quick Control screen, as well as a 3.5mm microphone terminal. 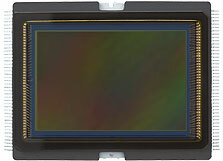 The CMOS sensor's drive system significantly increases image processor performance, reducing color artifacts and moiré (a common problem that occurs in scenes with horizontal lines), and ensures that the EOS 6D can record at a number of frame rates up to ISO 25600 in H mode. The new EOS 6D features built-in Wi-Fi®, incorporating cutting edge technology into the camera's compact and lightweight design. The EOS 6D's exposure settings such as aperture, shutter speed and ISO, focus, and shutter can be operated wirelessly using an iOS or Android smartphone* with the free Canon Camera Connect app**. Using a smartphone with the Camera Connect app** installed, shoot remotely from a distance, even in Live View mode, for those difficult-to-capture shots; you can also review images in the EOS 6D without having to take it out of the bag, and easily transfer and save images directly from the camera to a smartphone. Full DLNA (Digital Living Network Alliance) compatibility means easy sharing between the EOS 6D and other DLNA products, like HDTVs, smartphones and more. Still images can even be transferred between two Wi-Fi enabled Canon cameras over a Local Area Network. Images and video can be uploaded instantly to CANON iMAGE GATEWAY# for easy sharing on social networking sites, and photos can even be printed on a Wi-Fi® compatible printer^ without the need for a PC. Remarkably, the EOS 6D gains all of these wireless features without the need for any additional accessories; they're built right in! Ideal for travel or nature photography, the EOS 6D's built-in GPS## can record longitude, latitude and altitude data as EXIF data, can track movement at set intervals with its logging function and can even set the camera's internal clock to local time! When using the logger function on a computer, you will see the exact route you travelled, and the map will show you where and when you took each image. For photographers on the move, there's nothing quite like the full-frame performance available with the EOS 6D. It's designed to be portable, light and simple to operate yet doesn't compromise the quality one expects from EOS SLRs. With an aluminum alloy and polycarbonate chassis and a magnesium polycarbonate resin exterior, plus a shutter rated to 100,000 cycles, the EOS 6D offers the perfect combination of lightweight and durable materials for reliable operation day after day. The EOS 6D's 3.0" TFT LCD monitor has 1,040,000 dots, anti-reflective construction and features Canon's Clear View technology for a bright, sharp display in any number of shooting situations. 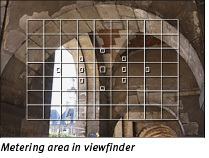 It's ideal for reviewing settings and images, as well as for shooting in Live View mode. In Live View, grid lines can be displayed in 9 sections, 24 sections, or 9 sections with diagonals, as can the electronic level, which helps ensure accurate level by displaying roll. 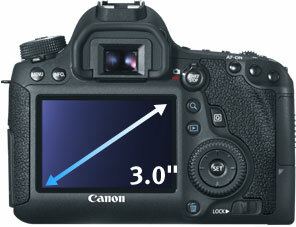 For image review, the EOS 6D has a dedicated Magnify/Reduce button. While pressing the button, zooming in or out (up to 10x) is achieved simply by turning the Main Dial. Images can be protected or erased quickly, individually or in batches, and slideshows can be created with some or all images and can be sequenced by date, folders, movies, stills or rating. A feature guide can be accessed for the selected menu, providing detailed reference information whenever needed. The EOS 6D offers a Multiple Exposure mode for film-like image creation with the convenience of in-camera processing. It offers two different compositing methods for proper exposure and composition: additive or average. 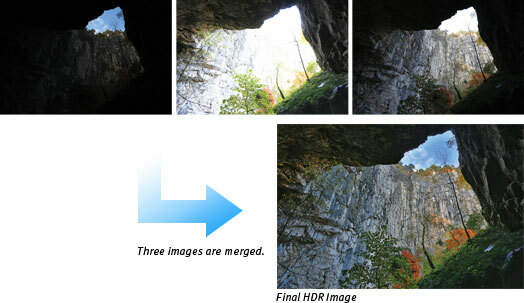 Multiple exposure shots from 2 to 9 are stored as one final image and can be taken in both RAW and JPEG shooting modes. A RAW image previously captured by the EOS 6D (3:2 aspect ratio only) can be used as a starting point, and cumulative results can be observed and corrected in real time on the camera's LCD screen. The EOS 6D uses popular SD, SDHC, SDXC memory cards, and is even compatible with the newest Ultra High Speed (UHS-I) memory cards. Compact and available in large capacities, SD, SDHC and SDXC memory cards are a perfect complement to the portable EOS 6D's lightweight design. *** This software enables you to upload images to social network services. Before uploading images, please be aware that image files may contain privacy related information such as people and places. If necessary, please delete such information. Canon does not obtain, collect or use such images or any information included in such images through this software. ^ DPS over IP certified printer is required.